Two DreamMaker Bath & Kitchen remodeling franchises have been named to Remodeling magazine’s 2014 list of the top full-service remodelers in America. The top of that pyramid includes DreamMaker Bath & Kitchen of St. Louis Park, Minnesota, and DreamMaker Bath & Kitchen of Bakersfield, California. The Minnesota franchise is owned by Lynn and Sandy Monson, who have been part of the franchise system for 15 years. The Bakersfield business is owned by Patty and Everett Gray, who have been franchisees for a decade and recently renewed for another 10 years. Monson said systems and buying power provided by DreamMaker have helped him become successful — and even more important have been the relationships built within the remodeling franchise. 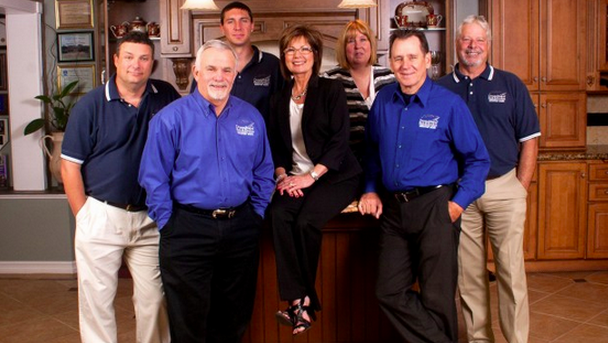 The team at DreamMaker Bath & Kitchen of Bakersfield. The Monsons and the Grays both run exceptional operations — but the operations do have some interesting differences. Lynn and Sandy tackle a wide range of remodeling projects: kitchens and bathrooms, of course, as basement remodels, sunrooms, room additions and whole-house remodels. In contrast, the Grays specialize in bathroom and kitchen remodels, and they choose to focus mainly on those services. The comprehensiveness of DreamMaker’s systems, and the flexibility of its business model, allows remodelers to focus on one or two services and concentrate their marketing activities on those areas, and it also allows franchisees to expand their service offerings to benefit from repeat business and a wider range of job opportunities. As the Monsons and Grays illustrate, depending on the skills of the franchisee and the demands of the marketplace, both business models can be extremely successful. Ready to start a remodeling franchise or improve your remodeling business? DreamMaker is blessed to have a fantastic group of franchisees nationwide, and we are looking for people who have the drive to succeed, who value professionalism, who are drawn to our Code of Values, who like to learn and are eager to embrace proven systems, who have a teamwork mentality, and who want to run a business that makes a difference in people’s lives. To start a conversation, call us at 1-866-734-7006 or fill out a form to download our free franchise report. You also can read our blog for stories about DreamMaker franchisees. We look forward to hearing your story, too!